A shoal follows the point of land&apos;s finger far out into the Graveyard of the Atlantic. Heaving swells, grown powerful in their travel across the ocean, thrash in agony as they meet the shoal and die. Seagulls and pelicans bank warily overhead, though fish by the hundreds flash in the shallows. They know that swooping down for a meal can bring crash landings as the waves leap and lunge. The Italian explorer Giovanni da Verrazano found this place in 1524, and in 1585 Sir Walter Raleigh&apos;s ship, the Tiger, nearly wrecked here en route to Roanoke Island, Va. Countless ships over countless years have expected deep water and foundered here on what are known as the Frying Pan Shoals. The bones of many of them are still scattered about the shoal, sometimes under the sands, sometimes exposed by a passing storm. It&apos;s no small wonder that for centuries seamen have called the point of land Cape Fear. The fearsomeness of the cape is usually only a background memory today. Now, anglers stand in the surf casting out, and children play on the white sand. Farther down the beach, swimmers and surfers enjoy the ocean. Behind the beach, sand dunes, like waves frozen in a storm, shelter strong grasses, flowers and live oaks. A ridge standing more than 50 feet high runs along the island behind the cape, hiding freshwater lagoons and marsh where wildlife, even alligators, thrive. Trails filter through a protected maritime forest. Years ago, as ships began to work their way into the Cape Fear River, they used a tall, treeless sand dome high on the island as a landmark. The dome gave the island the name Bald Head. This island, from which Cape Fear extends, has been home to American Indians, pirates, forts, armies and overworked lifesaving stations. Now, it is a place for people who love the sea and its shore, who love marshes and forests, and who love superlative island living. There are some 1,060 private residences tucked away within the dunes, trees and marsh. 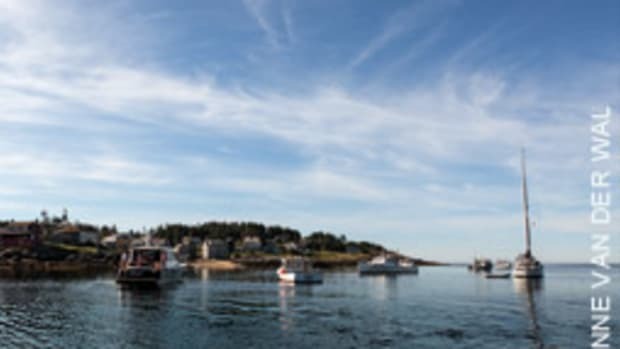 Many are second homes and rentals, while approximately 220 people live on the island year-round. The area of the island community is around 12,000 acres - 10,000 of which are protected and will remain undeveloped - and there are 14 miles of beach. The development in the remaining 2,000 acres is carefully controlled to ensure minimum infringement on the natural landscape and seascape. The homes are found in seven residential areas: West Beach, South Beach, East Beach, Marsh and Creek, Maritime Forest, Harbour Village and Golf Course. The island has its own sewage plant, water system and security patrol. In the interior, you&apos;ll find a small shopping center that includes a hardware store, clothing stores and a well-stocked grocery store and deli. Electricity, telephone, and cable TV come from the mainland. Despite the modern comforts, the sounds you hear are mostly those of the sea and the breeze. The narrow lanes connecting families and activities are for walking, bikes and electric golf carts only. No trucks or cars are allowed except utility vehicles and those used temporarily for construction. 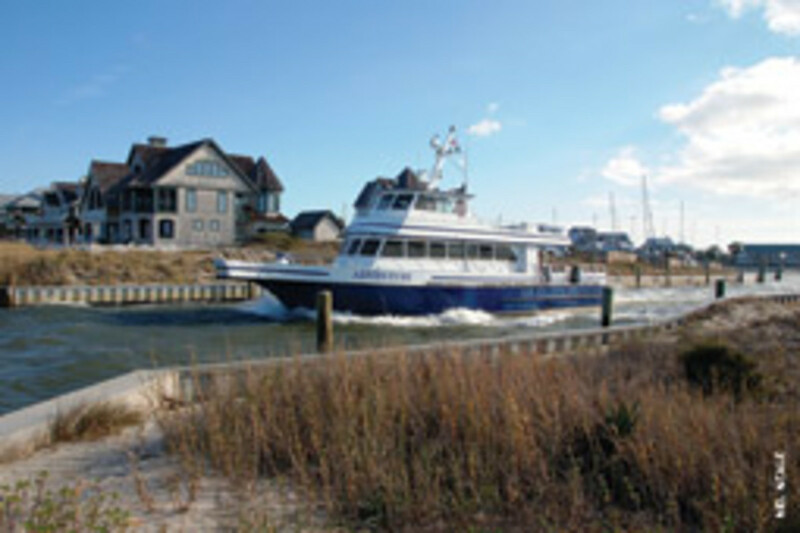 The only access to the island is by ferry or private boat. Today, Kent Mitchell, president/CEO of BHI Limited and an avid sailor, is actively involved in the island&apos;s management. The Village of Bald Head Island is a chartered municipality governed by an elected council and mayor. 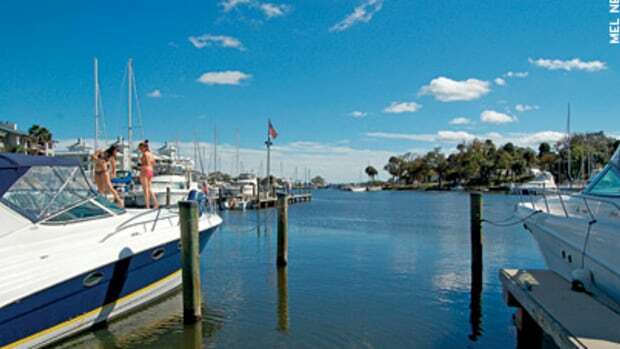 The marina harbor is two miles down the Cape Fear River from the Atlantic Intracoastal Waterway, near the village of Southport, N.C. Its entrance, just off the river&apos;s ship channel, is protected by two jetties and is on the inland side of the island, opposite the Cape Fear side. Its floating docks accommodate 180 boats to 110 feet and 7-foot draft. Most slips have cable TV, and there is 30-, 50-, and 100-amp electric service. High-capacity pumps dispense gas and diesel. To make reservations for a slip or shoreside accommodations, call (800) 234-1666. 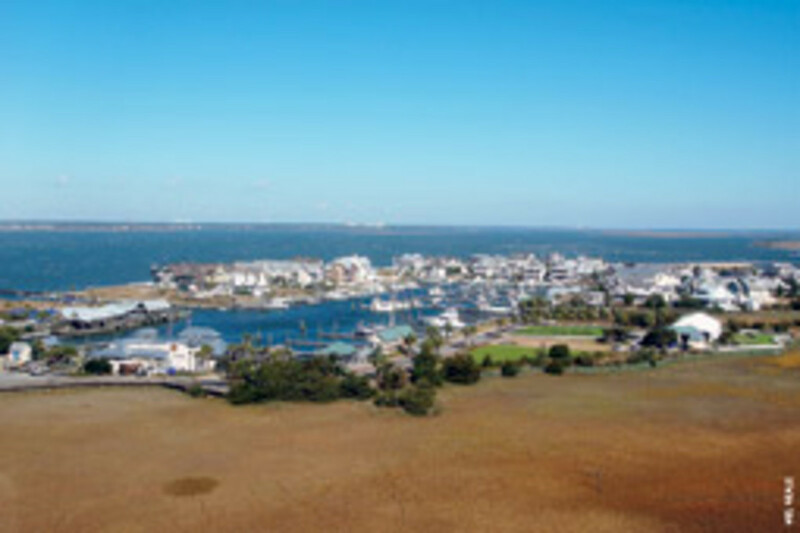 The island owners also have facilities at Indigo Plantation Marina, near Mile 310 on the ICW, with a 2-acre protected basin, and the new Deep Point Marina a short distance up the Cape Fear River, with transient dockage and the mainland ferry terminal. 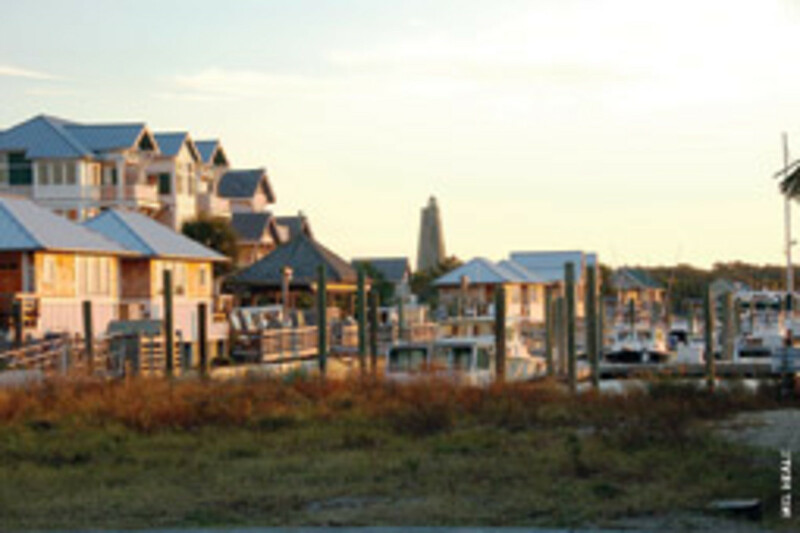 At Bald Head Island Marina, a concierge office can help you find and arrange whatever you may wish. The harbormaster&apos;s office includes a small but well-stocked ships store. Eb & Flo&apos;s Steam Bar overlooks the marina from behind a big, screened porch with tables inside and out. It&apos;s a relaxed and informal setting. Sit down in a rocker or at a table and eat a few shrimp, scallops, clams and oysters, mixed with butter and hot sauce and other things good, and wash it down with your favorite beverage. Live music on some evenings adds to the down-home flavor. If you are interested in more of a "fine dine" indoors, walk down the dock and around the store to visit the River Pilot Cafe. It serves excellent food from an impressive menu as though it were in the middle of a city competing with hundreds of other first-class restaurants, yet its atmosphere is informal and easy. Beside the docks, the island&apos;s library boasts its own small building with books to borrow or exchange. Nearby, the Riverside Adventure Company (www.riversideadventure.com) offers quality sports clothing and accessories, and rents golf carts, bikes, canoes, kayaks and other items. You can also get surfing instruction. 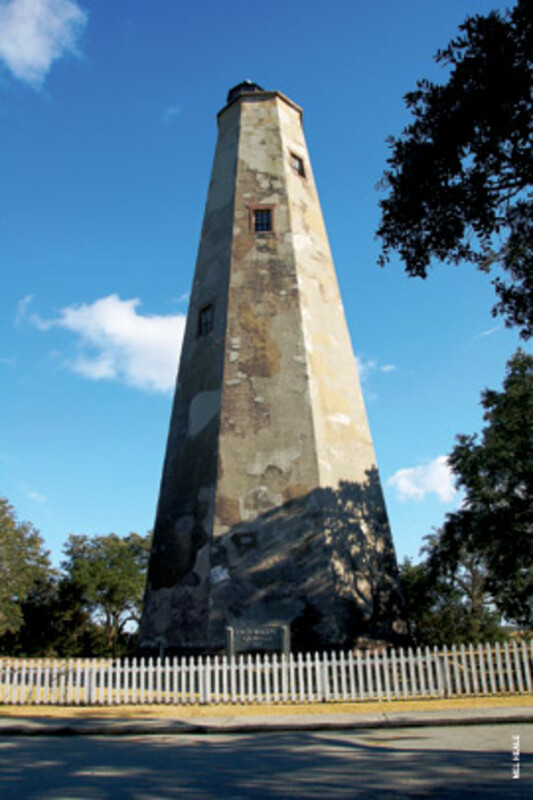 Historic island tours are available through the Old Baldy Foundation (www.oldbaldy.org). Your host knows the story and the island intimately, weaving the two together, stopping here and there for special views. 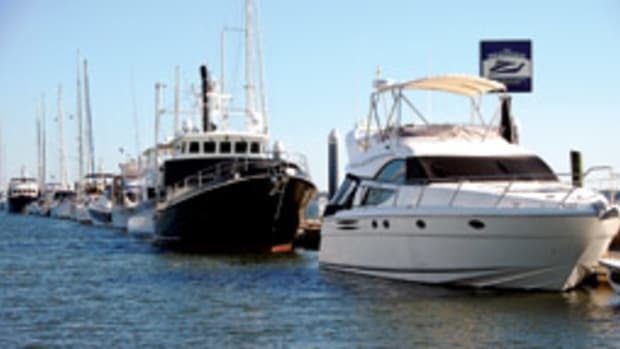 If you&apos;re interested in real estate, visit the Island Agency (www.theislandagency.com) next to the marina. 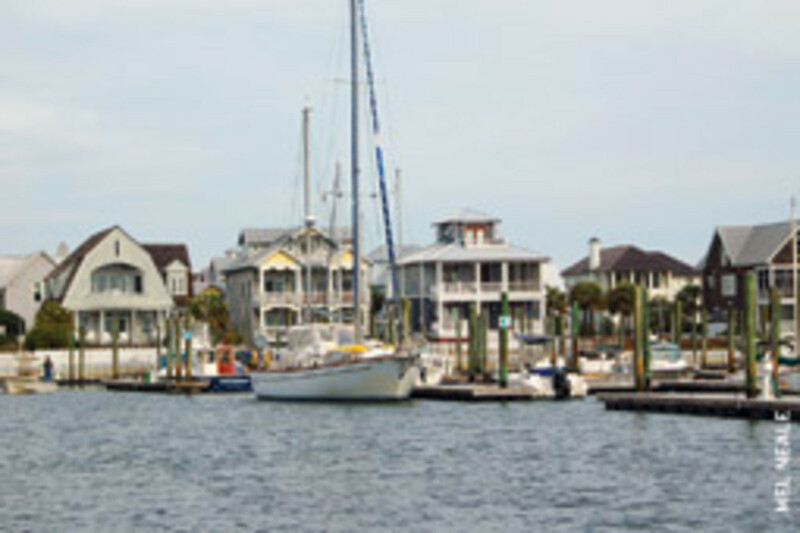 The Bald Head Island Sailing Club (www.bhisail ing.com) is headquartered at the marina. You&apos;ll notice some of its boats in the slips, including Optimists, Club 420s, and J/80s, the 26-footers known as family rocket ships in the sailing/racing world. Various types of memberships, from annual to weekly, allow you to learn to sail or sharpen your racing tactics with lessons from qualified instructors. There&apos;s also a "trial sail" available with one of the staff, which lasts approximately three hours. Recently, J World, the well-known performance sailing school, conducted a sold-out three-day yacht racing clinic at Bald Head, and more are planned. One of the first things we like to do when we arrive is take the short walk from the marina to climb the spiral stairs of Old Baldy Lighthouse. 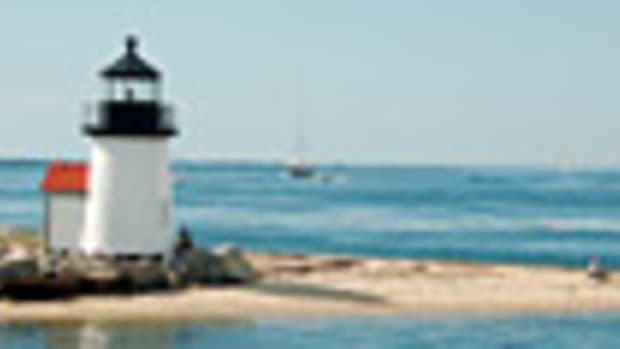 It was built in 1817 and is the oldest lighthouse structure in North Carolina. The brick walls at the base are 5 feet thick. In the chamber where the old whale oil light once shown, 110 feet high, you can see much of the island, as well as the river entrance, part of the shoals, Oak Island and Southport. Our most memorable trip to the top was when the winds were blowing gale force over the shoals. There are trails and creek walks and beaches near the marina, but you&apos;ll probably want to rent a bike or golf cart to explore the island. Bald Head is the southernmost barrier island in North Carolina, in an area that is the northernmost semitropical environment on the East Coast. North of this, it&apos;s very unlikely you&apos;ll find the Sabal palm growing naturally. The nearby Gulf Stream keeps the weather relatively mild year-round. The lanes that you&apos;ll travel as you explore are narrow - at times closed over in tree tunnels, at times high on the dunes overlooking the waves, winding around marsh, gliding by opulent golf course greens. We particularly love standing on the beach at the base of Frying Pan Shoals, looking out to the ocean where the shoal violates the sea. It&apos;s nothing short of spectacular, especially when you remember the seafaring history of the place - the storms, the shipwreck tragedies. We also love to take the quiet roads into the island&apos;s interior, where we find trails in marsh and woods. You hear only wind and trees, and the distant murmur - sometimes the roar - of the ocean. You smell only the woods, salt marshes and sea. One of our favorites is the Kent Mitchell trail. The area was chosen, and the trail laid out, by Kent Mitchell. BHI Limited then built it and leased it to the nature conservancy for $1 per year. It winds through marsh and wood, crossing creeks and pausing in hammocks to give great insight into the different natural features of the island. The Bald Head Island Club has fine dining with a special menu each week, along with a superb wine cellar. But you don&apos;t have to wear a tie or even a jacket. Bald Head isn&apos;t such a place. There&apos;s also a 25-meter pool, and you can see the ocean from its deck. Palmetto palms hide four tennis courts, and people move about the two meticulously tended croquet greenswards, often a part of important tournaments. The golfing is reason alone for many people - from far and wide - to seek out this island. Designed by Masters consultant George Cobb, the 6,855-yard course intimately winds through the extraordinary features of the island landscape. The play takes you across high dunes overlooking the ocean, deep inside a maritime forest, and among and around marshes and 15 lagoons where alligators add extra incentive to keep the balls dry. The course received a coveted 4.5-star rating from Golf Digest, putting it in the top 20 percent in difficulty. Travel and Leisure recently ranked Bald Head Island 26th in its 100 Top Golf Communities for two years in a row. Golf Digest listed the course as one of the top 10 in the greater Myrtle Beach, S.C., area, and the course was also ranked 45th out of 500 by North Carolina Magazine. If golfing isn&apos;t enough, the fishing in the Gulf Stream offshore attracts sportfishing yachts and their guests. 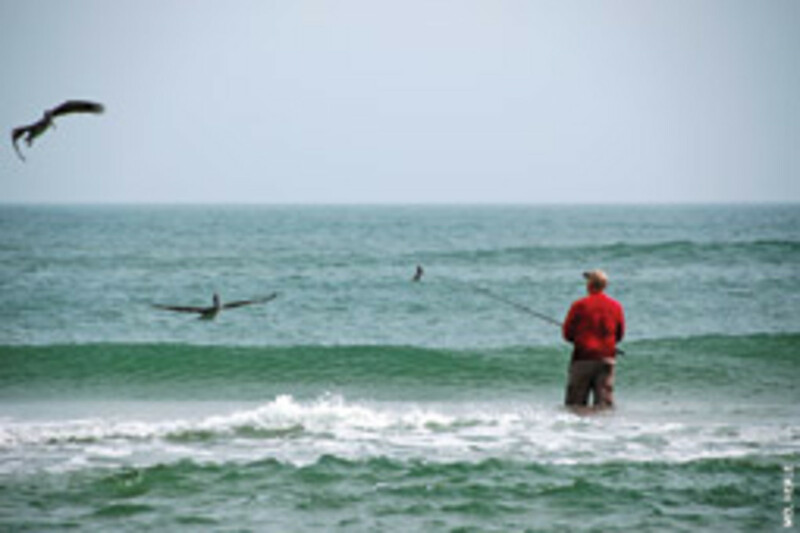 The island hosts the well-known Bald Head Island Fishing Rodeo in June, which can be "down home" with cooking under big tents, and very much "uptown" with entertainment at the Bald Head Island Club. Home ports of the gleaming sportfishing machines range from local to far away. 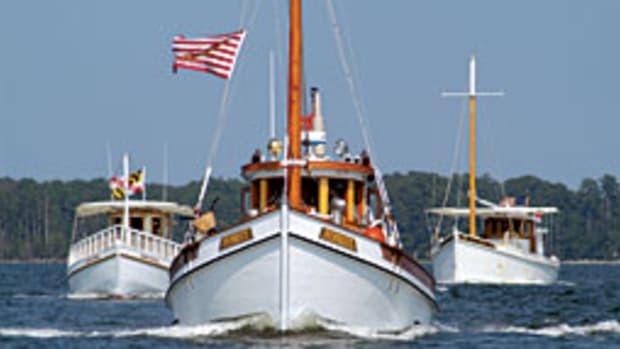 Boats also visit for the annual U.S. Open King Mackerel Tournament in nearby Southport. There are numerous special occasions celebrated on the island. For example, there are "Turtle Walk" vacation packages for those interested in learning more about the loggerheads that come here to lay eggs. Other special events include Pirate Weekend (midsummer), the Labor Day Beach Music Extravaganza, and the North Carolina Wine and Food Weekend (midfall). You can find more details on the island Web site&apos;s calendar page. For the last two years, BHI Limited, in conjunction with the Wounded Warriors Project, has sponsored and hosted several wounded vets and their families on the island. The community, businesses and developer come together to make it a very special weekend. Near the point of Cape Fear, the Shoals Club overlooks the spectacular Frying Pan Shoals. Built in the tradition of 19th century beach clubs, it has a 20,000-square-foot cedar-sided clubhouse, expansive decks, pools, fitness room, private parking, and umbrella, chair and towel service for adjacent beaches. Its open-air Sandbar Grille serves appetizers, salads, sandwiches, burgers and soups. For fine dining, there&apos;s also a 105-seat second-floor dining room featuring New American Cuisine, specializing in seafood. As a slip holder, you can obtain temporary membership in both clubs. When our day is over on Bald Head, we love to walk from our boat to the dunes beside the marina inlet, where we can watch huge freighters and tankers glide by spectacularly close to the beach as they make way to or from Wilmington. And because of the orientation of the island, from here we can also watch the sun set over the Atlantic - a rare treat on the East Coast. 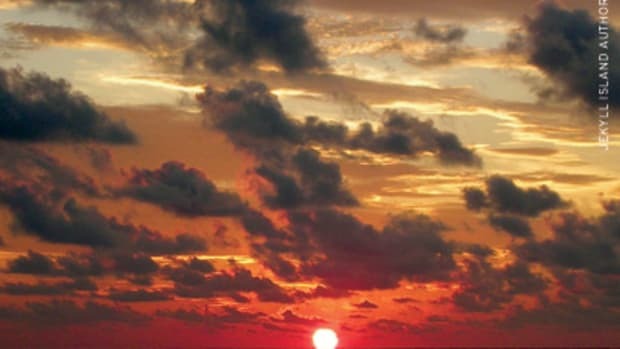 And on the eastern shores of the island you can watch the sun rise. Such is Bald Head - an island that has the best of many worlds. 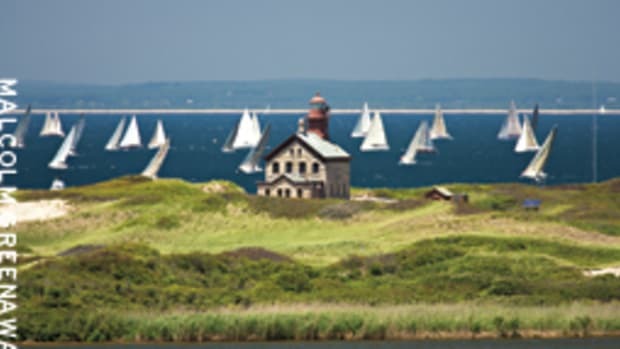 These worlds can be sunrise or sunset over the ocean, elegant living or immersion in unspoiled wilderness, riding out a storm in a safe harbor or viewing a storm from the beach of Cape Fear, golfing or high-tech sailboat racing, eating seafood or catching it ... well, I could go on. Instead, come visit and see for yourself.